“I had to be 100%, and I could not be just 99%,” he told Boca Juniors fans. Tevez earn a record 38 million euros a year in China. 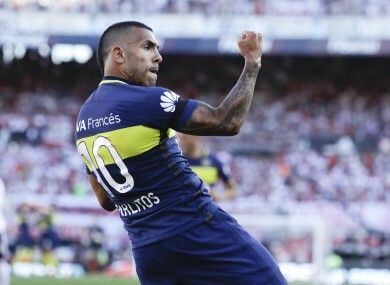 CARLOS TEVEZ ADMITTED Saturday that his move to Shanghai Shenhua in China, where he will earn a record 38 million euros a year, was prompted by fears over his declining physical fitness. The 32-year-old Argentine told Boca Juniors fans in a video message that he would be betraying the club if he continued to play for the team when he was not at the peak of his powers. “I had to be 100%, and I could not be just 99% because otherwise it was bad for the club,” explained Tevez in his first public comments on his move to China where he is expected to earn 20 times his current salary. In 2015, Tevez returned for a second spell at Boca Juniors from Juventus where he still had a year to run on a lucrative contract with the Italian giants. At Boca, he was paid $2 million, a salary far inferior to what he was getting in Serie A as he ended a nine-year spell in Europe where he had also appeared for Manchester United, Manchester City and West Ham. “I am going to miss you, life continues and you have to keep moving forward,” he added on Saturday. Email “Carlos Tevez fit enough for China, not Argentina”. Feedback on “Carlos Tevez fit enough for China, not Argentina”.